Getting to the point of this and the last blog titles, it should be repeated once more that all of the proceeds from Cleveland Indians Fantasy Camp go straight to Cleveland Indians Charities. I’m not just talking about the cost people pay to attend the camp (which campers could probably just write off–hence, the titles of the past two blogs). Each night we hold something called Kangaroo Kourt. And before you try to correct me, “Court” is spelled with a “K” for this word. I can’t back that up, but every time I see it written on things down here it has a “K,” so we’ll stick with that. Anyway, Kangaroo Kourt is a nightly occurence where we have a Judge (former player Gary Bell) and he fines different campers and Pros for stupid mistakes they had during the day. There could be a $5.00 fine for someone who missed an easy pop-fly. Or a $20.00 fine if you strikeout looking. We even had a veteran camper who opted not to come to camp this year to instead go to Las Vegas and he was going to be fined $500.00 when he came back next year. Oddly enough, he showed up to last night’s Kangaroo Kourt on his way in to Las Vegas, heard about the fine (even though it was more of a joke) and shelled out $500.00! All of the fines go straight to Cleveland Indians Charities, so we like fining people. Sitting in on the Kourts is one of the coolest things to see during camp–at least for me. It amazes me how generous people are here. The majority of the people donate more money than they are fined. We had a guy that was fined $5.00 and he put in $30. It is an awesome thing and for that, we thank the campers and the Pros (because they get fined just as much)! Tonight is our last Kangaroo Kourt of the week because tomorrow starts the Pros vs. Campers game, the Playoffs and we have a little BBQ in the ballpark. In case you are wondering, “Azcue’s Miscues” coached by Joe Azcue and Rick Waits are currently undefeated at 4-0 in their division (Heroes Division) and Mike Hargrove and Greg Swindell’s “Swindlers” are winning their division with a 3-1 record. 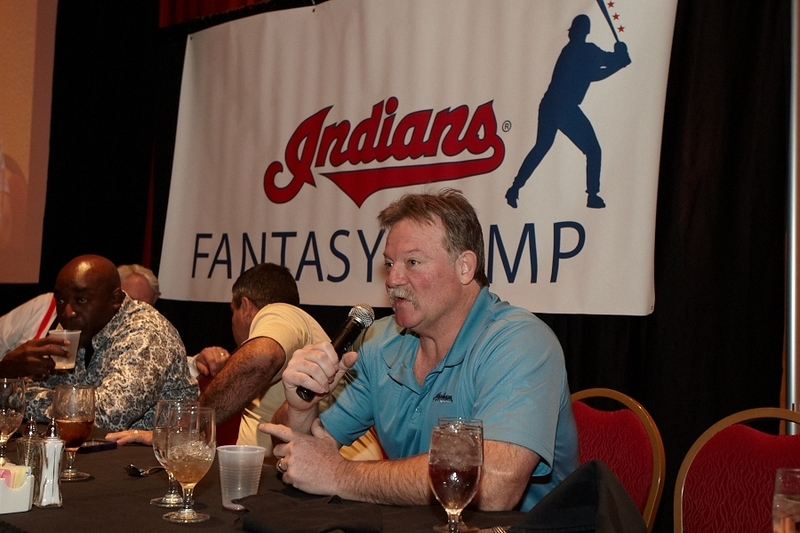 To my to readers of this blog, if you are interested in more information on Cleveland Indians Fantasy Camp for next year call our Fan Service department at 216-420-HITS. Day 2 of Cleveland Indians Fantasy Camp is here. Today’s high temperature is supposed to be 79 degrees. The high temperature in Cleveland at Progressive Field, a sweltering 15 degrees and snow. We’ll keep today’s entry short, only because I don’t have a lot of time today. Last night at our “end of the night” meeting we paid a special tribute to Mr. Bob Feller. A tribute video was shown following Bob’s life in the majors up until his last year at Fantasy Camp (January 2010). All of the campers received special t-shirts for the occassion and a few other personal moments and tributes were shared. I won’t discuss those, because those are the types of things that need to only be known to the campers and staff here. It was a very nice night and I think Mr. Feller would have enjoyed it. Actually, he probably would have been upset that all the commotion was for him when we could have been spending our time playing baseball. As promised, I have the Pros’ names and the teams that they are managing for the week. The games are going on as I type this. So those are your Pros, ladies and gentlemen. In addition to the former players being team managers, they will also play the campers at the end of the week in the Pros vs. Campers game. I’ll try and get a picture or two of that catastrophe when I can! Welcome To Fantasy Island…I mean Camp! Fantasy Camp. We have begun day one of the Cleveland Indians Fantasy Camp, where all proceeds go to Cleveland Indians Charities. The campers arrived to the hotel (Renaissance Hotel in Glendale) late last night and had a quick welcome banquet. They were greeted with warm welcomes from the Pros–which are Indians alumni. It’s fun to watch how excited these grown men are to play baseball for a week. Of course, it is even more fun on day two to watch how sore and slow moving they are because they realize how out of shape they are! Throughout the week, I will be updating this blog and hopefully have some exciting stories to tell. So far today, they arrived at the complex, found out where their lockers are (the campers use the visitor’s locker room) and have started some clinics. This afternoon they will be playing two games so that the Pros can get a look at how they play. The Pros will then hold a secret draft, picking players that they think could win a championship by the end of the week. It gets pretty competitive! While here, the campers will live as close to how real ballplayers live as possible. When they are driven to the camp they will have all access to the visitor’s clubhouse and have the Cleveland Indian’s clubhouse staff take care of them…just like the big leagues. Their uniforms will be washed everyday, they have breakfast and lunch prepared by our in house food service staff and can even have as many sunflower seeds as they can handle. Once the campers find out what team they are on later tonight, they all go out to dinner as a team with their coaches (the Pros). After dinner, we’ll have a quick meeting and a bull session or two and then bed. Tomorrow, I will have a break down of what Pros we have here and what teams they are coaching. The “season” games start tomorrow morning right after player photos take place. I’ll keep you all posted!